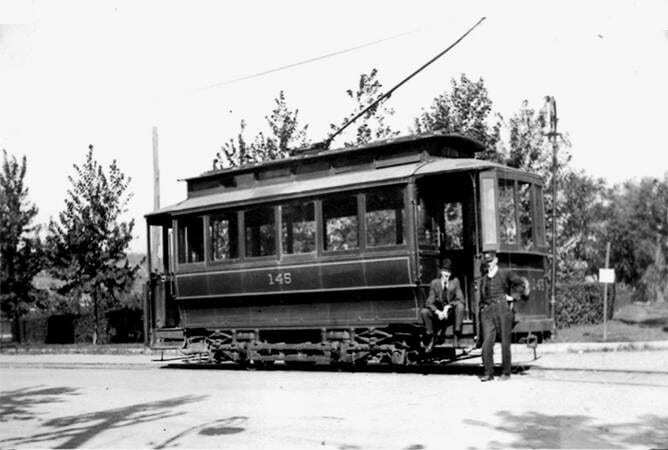 1890s Trolley from Georgetown reached Wisconsin Avenue at Western Avenue. 1899 AU Park, Montgomery County subdivided for development. 1910 Boundary Avenue was constructed [now Western Avenue]. 1914 Friendship Heights Village incorporated as a special tax district. 1925 Louis Shoemaker’s heirs sold their 52-acre farm to Donald Woodward. 1930s Wilbert subdivision was developed. 1938-43 Cooper Lightbown Co. built 150 Brookdale homes in Brookdale North and South. 1942-45 During World War II the area next to Cortland Road, now the GEICO parking lot, was a Victory Garden. 1946 Two separate sections of Overbrook Road were joined. About four houses were built on the new piece between Newport and Keokuk. 1946-1947 Orchardale subdivided for development. 1947-48 Dover Court was built, with its homes. 1950 Lord & Taylor and Woodward & Lothrop department stores opened at intersection of Wisconsin and Western avenues. 1953 Chevy Chase shopping center built east of Wisconsin Avenue. 1957 In a letter from a GEICO senior VP to the President of the Brookdale Citizens Association, GEICO made a series of promises in return for Brookdale’s support of GEICO’s application for limited development. Letter promised no road access to Brookdale, an 85-foot “green” buffer for Brookdale and said, “The Company has no intention of disposing of any of this land.” GEICO was granted commercial rezoning for the land under its building (only). Parking lots were allowed under special exception. 1958 Brookdale Citizens Association was incorporated by Paul Hawkins, Edward Nicholson, Jr., and Mary Murray. 1957-1962 Jay Wohlfarth developed Wohlshire. 1962 River Road widened from two to four lanes. 1964 Saks Fifth Avenue opened. 1964 West Chevy Chase Master Plan adopted: All of the GEICO site was allowed to be commercial except for an 85-foot strip along Cortland Road. GEICO did not apply for the rezoning. 1964-70s Barlow, Polinger and Thelma Edwards developed Friendship Heights Village with high rises and commercial buildings. 1966 Highland House, the Irene, and the Willoughby constructed. GEICO petitioned for additional parking lots, leading to controversy in January 1967 when GEICO cut its trees although approval had not been given. 1971 GEICO requested an extension of the Central Business District (CBD) to include its site (with zoning implications). 1974 Sector Plan adopted: Recommended a scale-back of development related to the ability of feeder roads to serve the businesses. It removed 24 acres from the CBD and recommended no further development on the GEICO site. 1977 Neiman Marcus/Mazza Gallerie opened. 1980 Bill McElroy, Bob Cope, and Norm Knopf stopped development of a multi-story building in Boundary Park. 1984 Friendship Heights Metro station opened (originally scheduled for 1976). 1990 Chevy Chase Pavilion opened. 1998 New Friendship Heights Sector Plan was adopted, dominated by a policy that growth is encouraged around Metro Stations. Development was approved on three major sites: GEICO, “Wisconsin Place” on Hecht’s site (by New England Development), and “Chevy Chase Center,” east of Wisconsin Avenue (by Chevy Chase Land Company). 2013 GEICO’s Preliminary Plan for development (approved in 1999) extended for six more years. Plan includes 810,000 feet of office space, 300 multi-family units, and 200 townhomes, along with a 50-foot buffer zone between GEICO and Brookdale, and transfer of Brookdale Park to Montgomery County. 2015 75th Anniversary celebration and Brookdale entrance signs were installed.